1. What infection control measures should the healthcare provider implement? Use correct handwashing techniques before and after your assessment. 2. What method should be used to measure temperature for this adult client? Temperature is best taken using the tympanic or axillary route; because the client is nauseated, the oral route could stimulate the gag reflex. 3. What pulse and blood pressure readings should be taken for this adult client? Orthostatic vital signs (pulse and blood pressure) should be taken because this client is at risk for hypovolemia. The client may be dehydrated as a result of the vomiting and diarrhea and lack of fluid intake. Return to the chapter on blood pressure for more information on hypovolemia and its effects on vital signs. Next, see and read the vital sign record below. On a piece of paper, write down each of the client’s vital sign readings, and if applicable, the route used and the client’s position. 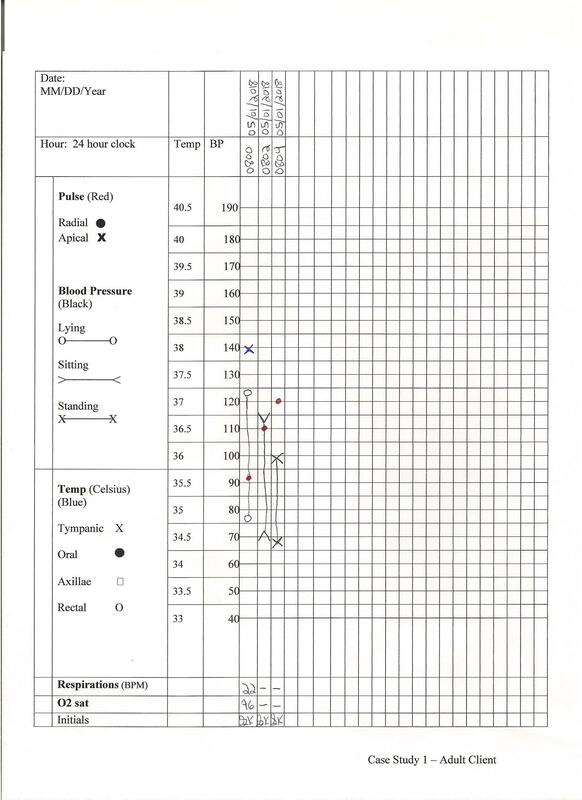 Go to the next page to view the vital sign readings based on the record above.